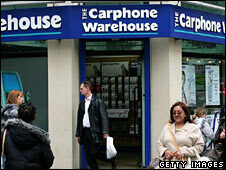 Carphone Warehouse is selling a half share in its retailing business to US firm Best Buy for £1.1bn. The deal is intended to create a powerful new force in UK and European electronics and electrical retailing. Reports suggest some of the war-chest may be used to buy the UK business of broadband firm Tiscali. Best Buy is the world's largest consumer electronics retailer with 150,000 staff, annual sales of more than £20bn and a 20% US market share. It operates from giant superstores, typically 40,000 sq ft in size, equivalent to a large British supermarket. One of the main reasons for forming the joint venture with Carphone Warehouse is to bring these superstores to the UK and Europe, with the first ones scheduled to open in 2009, and branded as Best Buy. However, existing Carphone Warehouse shops will not change their branding or format. Carphone's founder and chief executive, Charles Dunstone, says the jointly owned company wants to build as big a share of the European market as Best Buy has in the US. The move marked "the next big step" in the firm's growth, he said. Under the deal, the ownership of Carphone Warehouse as a corporate entity remains unchanged. It is selling a half share in what it calls its distribution business, which operates 2,400 stores in nine European countries. Best Buy is not buying any of Carphone Warehouse's broadband or telephony operation, which trades under the TalkTalk and AOL brands. Carphone Warehouse will use the £1.1bn being paid by Best Buy to reduce its debt and invest in developing both the broadband and retailing businesses. The deal comes at a time when trading is difficult in the UK for many retailers. The market leader in electricals and electronics retailing, DSG – the owner of Currys – has been having a particularly torrid time and has issued two profit warnings since the start of the year.